An essential skill for any type of business success is the ability to speak effectively and enthusiastically to a group. By the end of this program, you will be able to grab the attention of your audience; identify vocal, verbal, visual problems and correct them; handle questions; and maximize your environment. Don’t just speak; create a stellar presentation that informs, persuades and gets results! Looking to get feedback on your resume? Interview tips? Or maybe some advice on how to advance in your career? Stop by the Career Corner where MentorNJ mentors/representatives will be onsite to meet with you one-on-one to answer all of your professional development questions. MentorNJ is supported by LibraryLinkNJ and the NJ State Library. Communicating with all library staff in order to share news, solicit feedback or improve morale is a challenge given the many schedules and duties of library employees. In this pre-conference workshop, professional management consultant Elizabeth A. Winters will explore the important topic of effective communication in the library workplace. This workshop will focus on different methods of communication for library staff and how to distinguish which methods would be most successful for your library's needs. This workshop will equip you with the tips and strategies you need to develop a successful communication strategy for your library staff. Do you have a great idea, but wonder how you can present it to your supervisor or library director? A group of panelists will talk about what things you need to consider in order to sell your idea effectively. Bring a sample idea or proposal of your own if you want to get feedback from panelists. Participate in one-on-one mock interviews and/or have your resume reviewed with the help of several experienced librarians and directors. This can be a valuable experience for new librarians, para-professionals, job seekers, or anyone looking to make sure their interview skills stay sharp and are interested in keeping their resume current. Mix, mingle and network with friends and colleagues. Mentors from the MentorNJ initiative will be available for professional development support. A special invitation is extended to those new to our profession. All are welcome to attend. After a day of sessions this is a perfect way to start your evening. Each attendee is responsible for their own costs. Eden Lounge is located within Harrah’s Resort. Join NJLA for a fabulous ending to a full day of conference programming. Mix, mingle and network with friends and colleagues at The Pool at Harrah’s to cap off the evening with a cash bar, informal networking and casual socializing -- and maybe even a dip in the pool. A special invitation is extended to NJLA leadership and graduates of the Emerging Leaders program. Have you identified your personal strengths and professional interests? Do you actively seek out opportunities to contribute to your library and professional communities? Attend this session to discover how to re-invigorate your passion for your profession! The presenters will provide examples of how to leverage librarians' personal interests, share knowledge within your library and encourage meaningful team work. These efforts contribute to your individual growth and the overall success of your library. Are you in a position to mentor new leaders? Learn tips and strategies that work for both professional and non-professional staff to prepare them to move up and become the leaders of tomorrow. Would you like assurance that your new hire has the information and support they need to succeed? How can you help them feel part of the team, become motivated to serve, succeed and stay? Good training! A panel of experienced library trainers and recent hires will illustrate how to welcome new employees and provide the resources they need. Attendees will be provided with a training template that can be modified to suit their individual library. 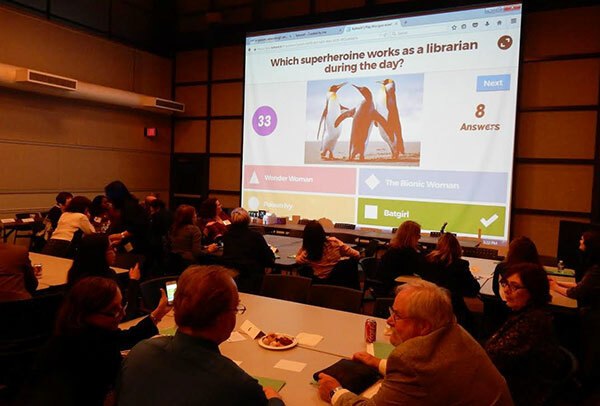 In 2015, one online networking meet-up was offered for professional networking among the library professionals and paraprofessionals in New Jersey. Program Title: Library Bootcamp, led by a moderator and a group of panelists. The project team conducted an online survey to pick a theme for the meet-up. Go to the program page for the program materials! A day that was dedicated exclusively to networking and celebrating the profession! The MentorNJ In-Person Networking Event at the Monroe Township Library on Friday, October 2, was a great success. 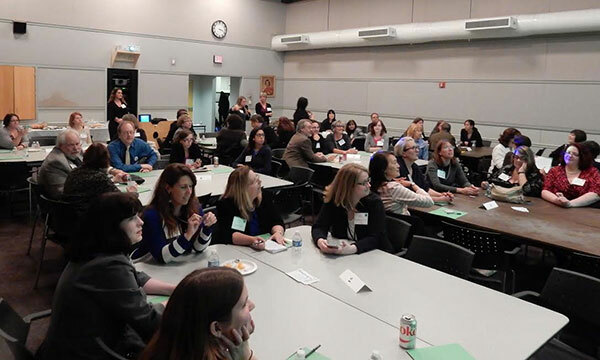 In spite of the uncooperative weather conditions (influenced by Hurricane Joaquin), 59 passionate library colleagues from around the state gathered together to network with each other to celebrate the profession, as promised! The Opening Talk, The Importance of Joining Professional Organizations and Attending Conferences and Webinars and the Panel Discussion, What Do Libraries Look for in Their Next Hire were both practical and lively. Participants then enjoyed collegial networking opportunities, mock interviews and resume reviews. Many attendees also sat for updated headshots with a professional photographer. As the final program of the day, everyone played a team-based Trivia Game, and the competition was funny and fierce! Julie Walsh was the wonderful emcee for the game, and all participants played to win (but fairly)! Eighteen lucky attendees won a prize, which included a Chromebook, a Polaroid Socialmatic, 5 Fitbit sets and 10 Chromecasts, and everyone received a MentorNJ promo pack with a lunch bag, lanyard, pen and a flyer! Location, time, pleasant environment, nice dedicated people, good selection of panelists, game playing! It makes me feel good, strong, proud of our profession. The ability and opportunity to meet new librarians. The panel about what libraries look for in their next hire was really helpful. Networking & pretty much everything! I'm new to NJ, so it was a nice way to get to know my new colleagues. Great advice from panelists, helpful resume advice, mock-interviews! I liked the networking options. The trivia game was great for getting to know new people. Happy to get a headshot. The MentorNJ Project Team would like to thank everyone who participated in the event and made it so much fun and valuable! We also thank you for sharing your feedback with us, and we'll make sure to take all your suggestions into consideration when we plan our future programs. Check out more information about MentorNJ. We would also like to give our special thanks to the NJ State Library and the LibraryLinkNJ staff for their help with event material preparation and to the speakers, panels and volunteers who shared practical advice and thoughts with all participants at the event. Registrations for MentorNJ Programs/Events are open to anyone who works at NJ libraries or Library School students who are currently enrolled in coursework for MLIS or Certified School Library Media Specialist in an accredited academic program in New Jersey. Anyone in the New Jersey Library Community is welcome to participate. MentorNJ online program recordings and materials are available on each program page for everyone! Online registration through LibraryLinkNJ website (user log-in required). If you need help with registration, please contact us at info@librarylinknj.org. I have been the director of the Mountainside Public Library since May 2017. Previously I was the Innovation Catalyst Librarian at the Trenton Free Public Library. I am the copyright coordinator for the university. I have been a school media specialist working with grades 4-8, and am currently in a 7-8 grade building. I am happy to be of assistance to anyone in need of help.